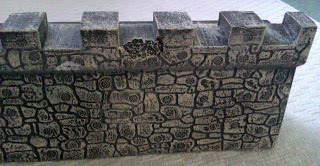 Siege Equipment: Mighty Fortress Castle. Part 5 - the even finaller than the last post, post. 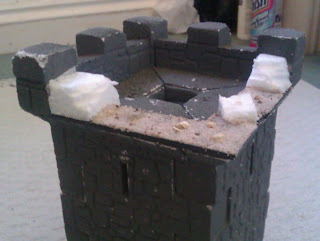 Following on from my posts about the construction of my Siege Towers, I've started work on the natural enemy of every Siege Tower ever constructed: a Castle! It might seem an odd way round to do things (Towers first, Castle second) but there was good reason. I've got a Siege game coming up this summer so there's time to prepare both with not much rush-factor. 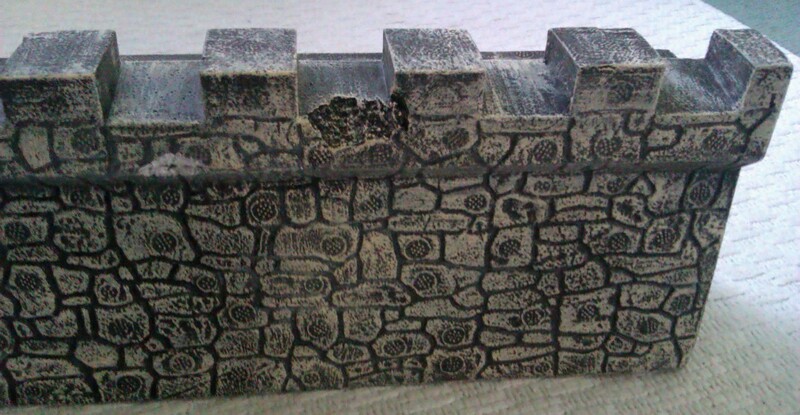 I've had one of the original Citadel "Mighty Fortress" sets for a very long time - getting on for 20 years or so but the paint job I applied to it back then was very basic (but usable in a pinch so if I did run short of time I could get away with it as it is). Also, I wanted to be able to be a bit more flexible with the castle construction for the game than the Mighty Fortress set allows, so I've been on the hunt for a second set. I recently picked one up from ebay so I've got everything I need now to get started. Each set comes with 4 x Towers, 4 x Wall sections and 2 x Gate sections. As I said I have two of these so I have four Gate sections. No castle on the planet is ever going to want four Gates, so I decided early on that I was going to sacrifice two of the Gate sections in order to be able to model some "Breached" and "Collapsed" wall sections. Here's a picture of the first Breach - I used everything from a Stanley blade to a hacksaw to chop this thing up - it's only made of Polystyrene Foam but it's a dense, solid block so it took some hacking! The arch section is shown here back in place in the wall to give an idea what it looked like before I started. 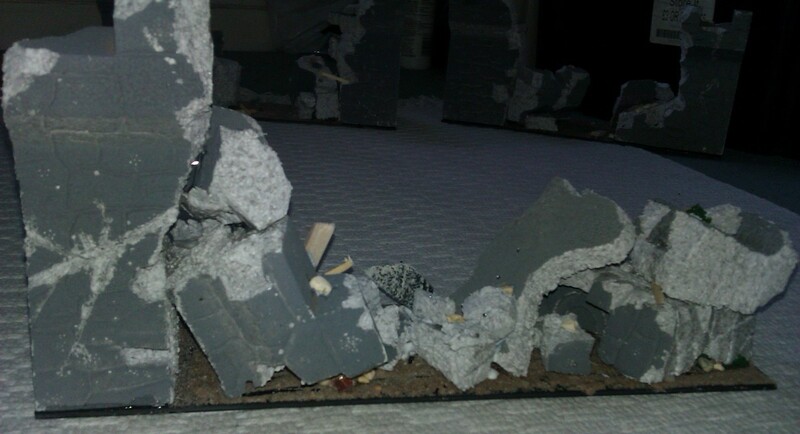 The arch section will get chopped up later in order to form a "collapsed" section and some rubble and suchlike. 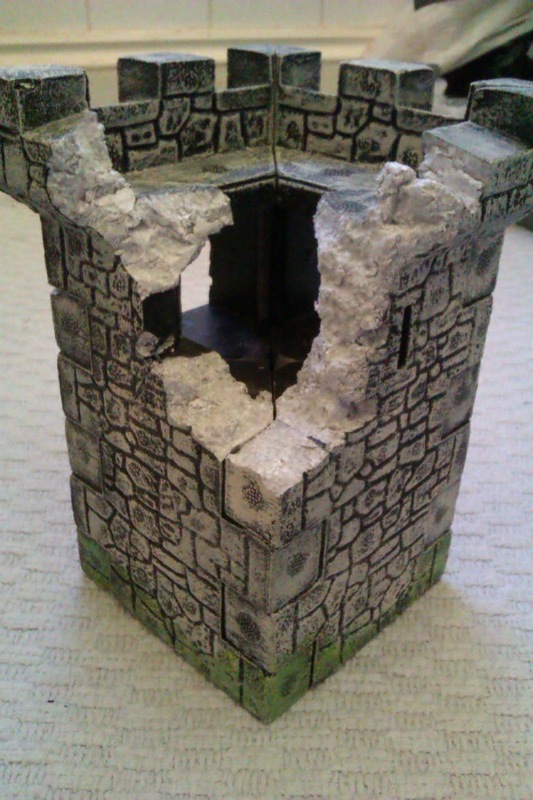 and various stages of damage to a Tower too. I'm generally getting better at hacking. Since my first post I've successfully carved up another Gate section to make the pieces for another Breach and have also chopped the "arch" section into rubble that I'll scatter about the place to make it look like these walls have genuinely fallen down rather than just had a bit "teleported away". I'll not bother you with photos of more broken polystyrene until it's all painted up - you've seen a breach above and one hole looks much like another. Then along the line of the cut, use the Exacto-blade to remove the occasional stone block. 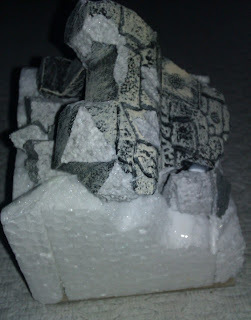 I applied the same techniques to the off-cuts in order to produce my "rubble" which is chunks ranging from a single "stone" to complete sections up to about 1.5'' long by 1'' high to represent bits that fell but didn't shatter. 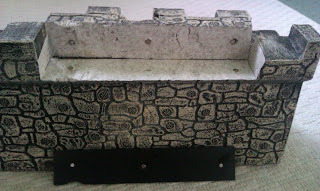 I've used a pointed-tool to make more of the wall brick-pattern in any flat surfaces that were created by cutting. Part 3 - "Smash it up!" 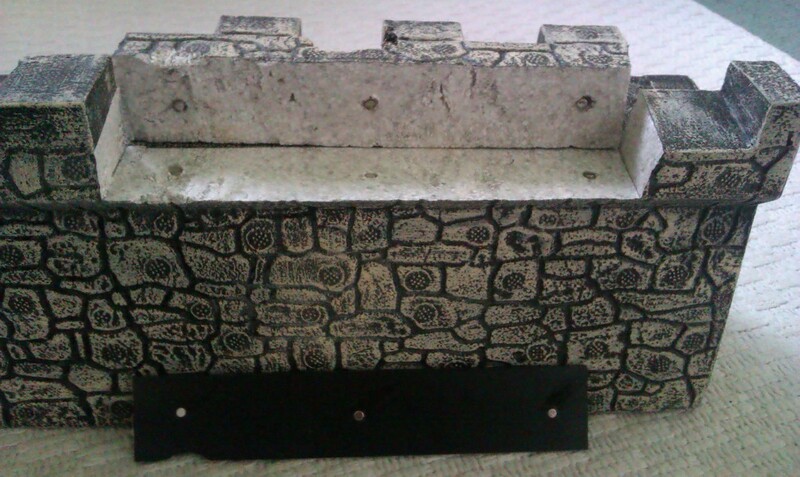 Both of these sections we made by taking a slice off the bottom of the wall sections which were created as described earlier and gluing them (using 2-part Epoxy) to a thick rectangle of plasticard cut to the same dimensions as the wall-section base. More epoxy was used (along with a host of tailor's pins) to secure a lot of "rubble" in, on and around the wall sections. Some cuts were made here and there to represent fractures (most easily seen in the upper picture on the right-hand-side) and a few bits of balsa-wood and snapped matchsticks glued in place. Everything else was textured with play-sand and a few bits of fish-tank gravel. 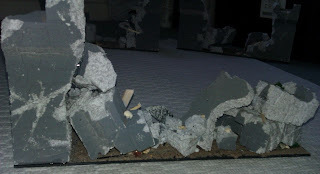 One of the damage types the 6th Edition Siege rules call to be represented is damage to the ramparts which means that troops on that castle section can still move around but can't gain cover. Theoretically this can occur on a tower or wall section, and a wall section can either be a regular wall or a wall with a gateway in it. 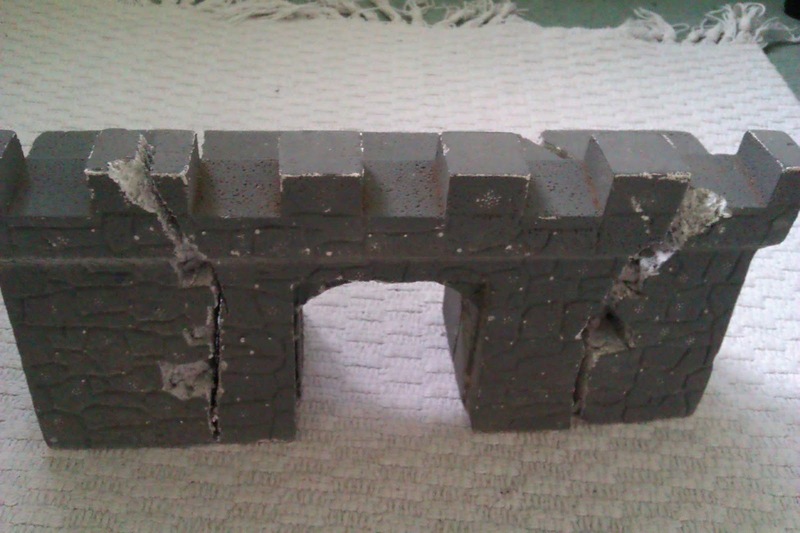 Now I don't have enough castle pieces available to sacrifice that many sections over and above what I've already sacrificed on this project, so I needed to devise a way of making damaged ramparts that could be swapped out for regular ramparts. 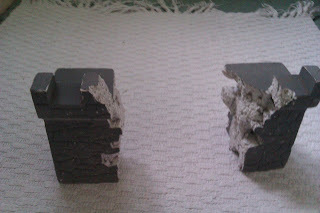 Since the model is made from polyfoam, I decided to cut the ramparts from my nominated sections - it's a solid model with no "space" within and as such both the walls and the ramparts I removed would be quite sturdy even when chopped up. My first attempts to do this were with a hot-wire cutter which were, frankly, disastrous. The HWC cut through the castle easily enough but I found it impossible to maintain a neat, straight cut along the whole length of the section I was removing. I opted in the end to use a blade for a snap-off DIY knife, but without the handle attached. This gave me a very flat blade that was about 8'' long and very, very sharp. 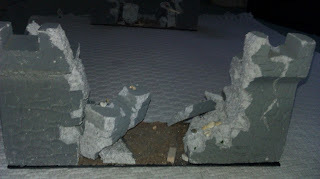 I could lay it flat on the walkway section of the ramparts and slide it along cutting deeper into the back of the rampart wall with each pass. It didn't take long to work all the way through and left a neat cut (and several not so neat cuts in my fingertips!). The polystyrene isn't as sturdy as the polyfoam and looks a bit "cloudy" in these photos, but the cellular structure of it does give is a "damaged stone-y" sort of texture and I'm hoping with a layer of paint over it it should look OK.
Well, I know I'd promised that the last update I did on this build was going to be the last one, but something was bugging me. My plan was to try and texture the walls, but the problem was that the polystyrene I'd used wasn't up to the job. There are different grades of "expanded polystyrene" and the one I'd used to build the tower was very soft (I suppose the gradings are all about just how much the polystyrene has been expanded by). This stuff was made of small "balls" or "cells" which were about 2mm across and quite "squashy". 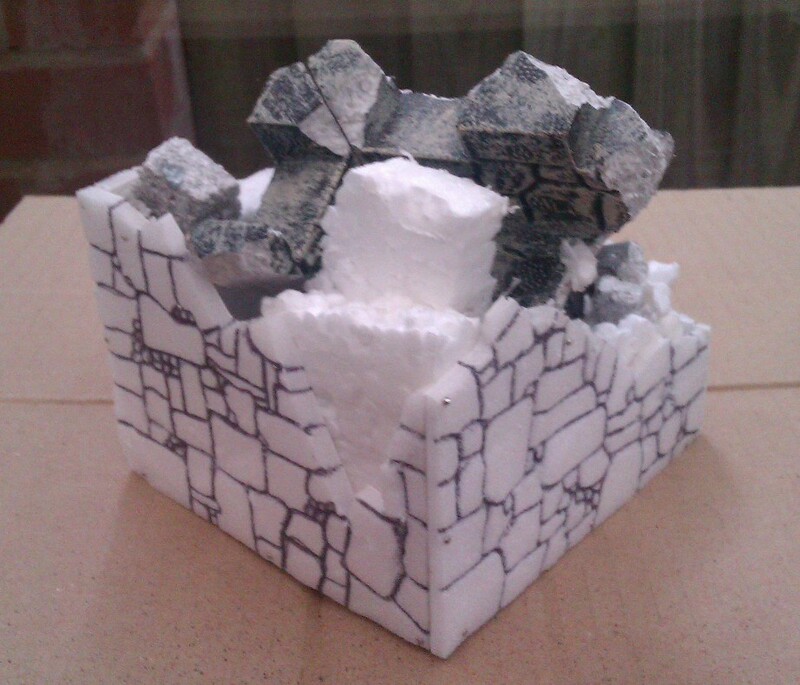 I became concerned about how much abuse it could withstand and also how I could go about adding texture to it. I was planning to just draw on a wall-pattern with a pen, leaving indentations in the foam, but it didn't work - the cells ruptured and came away. I'm going to start a new post shortly on my adventures in painting the castle. Stay tuned. One of the frustrating things about collecting a non-standard army from an unofficial army book (see my "Fan-Written Army Books" post) is sourcing the miniatures. When I decided to begin collecting a Nippon army, it was fairly straightforward to find models from Perry Miniatures (see also "Unboxing: Perry Miniatures Samurai") to fill in some of the Rare, Special and HQ army slots. Also quite easy was finding the Wargames Factory models required to fill most of the Core slots (See also: "Unboxing: Wargames Factory Samurai", "Unboxing: Wargames Factory Mounted Samurai", "Unboxing: Wargames Factory Ashigaru Yari Troops" and "Unboxing: Wargames Factory Missile Troops"). But Warhammer is supposed to be a Fantasy game, not a Historical game, right? Right! So I want monsters and wizards. That's not so easy to do as those models are rare. When Kensei get up and running (not sure how long that will take but their crowdfunding is complete now) I might be able to buy some of the more esoteric minis, but for now I'm left to scrabble around a bit and just "see what's out there". mons" and "Japanese Ogres" if you look for them on the interweb. They're definately treated as Daemons in the army list as they are "unstable" and cause "magical attacks". 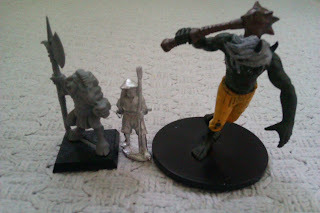 I found a good match for the illustration of Oni in an old D&D Miniature called an "Oni Night Haunter" and I fairly easily managed to pick three of these up from www.rpgminiatures.com for about £3.00 each. They come pre-painted and are moulded in one piece out of a plastic that's soft and pliable. You won't snap these guys but you may find paint flaking if you abuse this property. I've photographed the model next to one of the Perry Ashigaru and also next to a GW Chaos Bestman so you get an idea of the scale. The paintjob shown on the model is the pre-painted effort - I'll certainly be re-basing and re-painting the model (but I do like the white hair so I'll probably nick that).